The PADI Divemaster certification is the first level on the professional career ladder of recreational scuba diving. 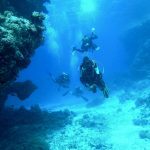 Working closely with our PADI Master Instructor and PADI Staff Instructor’s, in this program you expand your dive knowledge and hone your skills to the professional level. The Divemaster course is for those with more experience, but less time than those on our Divemaster Internships. You complete water skills and stamina exercises, as well as training exercises that stretch your ability to organize and solve problems as well as help others improve their scuba. You put this knowledge into action through a structured internship or series of practical training exercises. Conduct the PADI Skin Diver course and PADI Discover Snorkelling program. Conduct the PADI Seal Team AquaMission. It is highly recommended that you own all of your own scuba equipment, as familiarity with personal gear improves general scuba diving skills. If you don’t have all of your own kit we can arrange everything you will need at great prices. Let us know what your current diving certification level and diving agency you are certified with and we will give you a quote. For details of the cost’s and availability just send an e mail melissa@diveandseatenerife.com for more details.